This notebook is to be an exploratory work. I want to derive lists of what I really want, what activities I want to be involved with, to develop a plan designed to further my pursuits, help me gain ground and finally achieve my “goals.” Once I design goals, I will plan, but, as time goes on, while the goals may stay pretty much the same, the plans should be constantly revised, feedback obtained, digested and a new plan formulated. I want this process to be fun, and I invite myself to write in this notebook anything that might seem relevant or important, even if at first glance it seems rather obscure or unrelated. Very importantly, I want to develop a philosophy to synthesize the many observations I’ve had to date. This process should germinate personal momentum and should be self-regenerating. Vital to this self-generation, the system needs to be enjoyable, so that I will want to continue working at it. I draw a simple diagram. To put it simply, I want to go from A to B. I define A as my present state. This includes my thoughts, my previous experiences, my material wealth, my health and all the attributes that make up my present life. Now, if I describe how I would like to alter these variables, how I would like to change, what material possessions I wish to have, then I will be defining my destination, B.
I want to increase my personal momentum. Because I assume that the “distance” between my present state and future state is great, I need to gain the capacity to put my thoughts into positive actions with desired outcomes at an increased rate. I want to spend my time in the present life in the most worthwhile fashion possible. I might ask myself: What is good? What is the best possible outcome of my life?? This is something to ponder. that I be thorough in my assessments, planning each goal individually. I am attacking a mathematical problem on a fairly colossal order. I need to perceive the essence of the natural laws that determine the results of our efforts, which, in lieu of understanding, we are at the mercy of, but, in the event of mastery, we can use towards our own purposes. My solutions should be demonstrated by the noticeable increase in my achievements. I define “achievements” as my ability to put my thoughts into action. An examination of my thought processes will reveal that as my day passes, my mental energy is drained by menial needs, tasks and chores. I will present the way I would like my day to go, but I don’t know how realistic a picture I will paint. Perhaps the environment I happen to be in will not be conducive to my desires. I will paint the “perfect” picture of tomorrow, even if it is hopelessly unrealistic. Imagined: I visit Lucia and Joy (two sort of spacey women traveling together here in the Solo Khumbu). We engage in a conversation where they reveal the origin of their zany philosophy. After one hour, the three of us make love. I bid the ladies a good day. I return to my lodge. The Nepali woman is there. We have a coffee. We go downstairs. Then she and I make love. She promises to fly to Kathmandu to meet me. I pack my things. (I throw away my wet sweat pants.) I take a quick walk to a store and buy a book bag at a low price. I leave at 1pm and go to Jorsalle, have lunch, arrive in Lukla. Greg and Al are there. We get drunk. One of the Nepali women there appeals to me. I see her in a dark corridor. I grab her and passionately touch her and kiss her. She leads me to a room where she and I make love. I fall asleep. Morning: This is the way the day actually went. (This is pretty funny): Lucia & Joy showed up at the bank. I said, “Have you ever heard of the Great Karnak?… ” … “OK, then: Two minds soaring like cosmic birds.” Lucia said, “Lucia and Joy!” They loved it, but it was the last I saw of them. I went back to the hotel. The Nepali girl, Dilmaya (Hot Love), was there. We walked to the Everest Observatory. It was fun. Later, she went shopping with me. I bought a cheap bag and I paid three times what I should have for the socks. In the evening, I tried to put my arm around Dilmaya, but she rejected my advances. She said to wait a minute, then she went upstairs. Instead of her coming down, she sent down a group of about ten men. They told me there was no room in the hotel and that I’d have to leave! I felt like a vigilante. I considered taking a night walk but got tired and went to sleep in the dorm at Sherpa Trekkers Lodge. Needless to say, the difference between my ‘ideal’ day and my actual day were astounding. In fact, I feel so embarrassed by my performance—such a hopeless effort!—I don’t know where to begin today’s entry! The above four words signify a paradox that I detect in my ambitions: If personal happiness is my ultimate goal, then what is the necessity for amassing worldly goods and status? Happiness comes from within, from the realization of all the good, and the fantastic that abound in the world. A life of acceptance may yield personal happiness at its best, and boredom at its worst. A life of ambition could yield excitement, but the struggling may be a drag. Are goals and ambitions and their pursuit happiness-yielding or happiness-destroying or are happiness and goals unrelated?? If pursuing VITALNESS becomes my choice, then it would be likely that a life of ambition will deliver what I want. There are an unlimited number of realms of belief—why must I be bound to the common plane!!!? Tonight when I read this, it occurred to me that I could have both: “excitement and contentment,” “vitalness and happiness,” etc. It seems that I can have both. Could this be the zenith of existence? I believe the choice is mine. I could easily envision a life of pushing myself to my limit. This is one time that I’m sure I’m here (i.e., that I exist on this planet)! I want to put out so damn much in this life. I can think of the following example where belief itself is central to outcome: any time one’s belief that success is imminent causes one to try, where, in the absence of belief, one would not attempt the act, and the talent is there, and one tries and succeeds! Also, germane to this discussion is the experiment that I devised comparing what I wanted yesterday and what I got. It made me realize that the situation (environment) has got to be appropriate for the desired outcome. You can say something will happen, and you can even try to make it happen, but if in a given the situation, the odds are very much against you, your success is very unlikely. “What are the imbalances? ?” If I could discover imbalance – relative to myself and my talents – in the environment, then I might be able to get greater-than-average results, or even extraordinary results. In essence, this is a leveraging of circumstances. I’ve drawn a diagram about Sacrifice and Reward. It might be helpful for me to consider how much I am willing to sacrifice in order to get something. I divided sacrifice up into two parts: Replaceable and Irreplaceable. I’ve discussed issues such as Happiness/Vitalness, Sacrifice/Reward, One Goal/Various Goals, my desire to develop a system to drastically unleash my potentials, how to gain personal momentum, my need to share experiences with others, my need for change, newness, thrills; replaceable vs. irreplaceable sacrifices, seeking the imbalances in the environment vs. my skills and strong points, excitement vs. contentment, ambition vs. acceptance, the need to develop a plan, the need to enjoy my life as a focus vs. the need to spend my life in the most worthwhile fashion, and “secure” goals vs. “insecure” goals, the need to strive, the possibility of assessing sacrifice/reward in concrete terms. I have this flash of thought that I cause my own problems with women, but that I haven’t analyzed my behavior enough to see clearly what happens. It is like I put myself in the wrong positions, like a stupid chess player. Lord, I sometimes must be dumb!! I sense that I do or say something much less than optimal, but I am so accustomed to my own behaviors, strategies and responses that perhaps I go in and out of encounters without learning anything and therefore without understanding where I am going wrong. I want to give this a short example. I noticed a girl, Judith, seemed to be trying to catch my eye. Finally, I began talking to her. When I said I was going to take a night walk to Thyangboche, she said, “Let’s Go!” I said I wasn’t yet ready, but if, in a few hours, I was ready to split, we could go. Later, she said she’d changed her mind because the clouds came over. Still later, she seemed almost annoyed by me trying to talk with her; but when a male friend of hers tried to talk to her, she seemed receptive. What caused this change in behavior? Was it because I didn’t wholeheartedly agree with her theory on the Yeti? Could she sense that I’d take the first opportunity to get close to her, and did this frighten her off?? Or did she sense this and make an effort to discourage me because she wasn’t attracted? Where can I summon up the power to answer these questions and overcome my lack of understanding?? I’ll never have time to resolve the countless issues that bother me! I must find a quicker route, a way to bypass the routine problems, a warp, an avenue to a higher plane!!! The ROUTE! Concentration is genius. I must master concentration. Ego Debts – Creating lofty goals is sort of like borrowing money. These “ego debts” place a responsibility or pressure on the goal-maker to realize the accomplishments. As you place your thoughts in this direction, you’re satisfying the “debts” that you’ve created. I feel like I have slipped from my former momentum! And, feeling like my old system was ineffective, I feel as if I have nowhere magical to turn. I want the fantastic. PLAN THE FANTASTIC – ESCAPING PRACTICAL CONSIDERATIONS. (A creed!) I need to plan the fantastic in order to feel the thrill of vitalness. But it seems I keep allowing practical considerations to block my way. Practical considerations must dissipate like mists before the intense sun of living the fantastic. The point is to maintain a fantastic energy, thus keeping safely away from mediocrity and feelings of stagnation. Practical considerations must take second priority to fantastic considerations! How else can I break the vicious circle of practical consideration upon practical consideration!? I find myself waiting for things to happen—waiting is deadly, for patience kills the flow of the fantastic. Time is slipping through my fingers like liquid gold. Time is my most important asset. “Plan the fantastic, which means to never wait.” How can I implement these philosophies? The answer is simple, Do! The punctuation of these writing to date was my night climb twice as high on the ridge above Tengboche as the prayer-flag marker. Thousands of feet in the moonlight. As I thought of those words (“disassociate myself from my past”), I got a feeling of wonder, as if I had hit upon something big. The “practical” implications of this idea may help me. But, how can you disassociate yourself from your past, if the present is a summation of past events? Still, the literal argument misses the point, which is that only the present exists, and, in contemplation of your next step, the world is wide-open and waiting for the new entity (you) to react. The salient feature of the idea of disassociating oneself with the past is that it frees the mind from a common misconception that the past lives, allowing the person to think in terms of “now,” and that it relegates the importance of the past to its proper station behind the almighty present. I am looking for a new perception to carry us forward. Can I perceive some new realization about the human make-up that can give me insight as to how to achieve my goals? The philosophy I am creating could have could search for “a new perception,” that is, a new way of looking at the world. Maybe there is nothing more essential than truth. But one question I have is, “Can ends be met by believing specific untruths, as if viewing life as through a filter?” A horse’s blinders keep it on the desired road (though the desire may be his master’s). Discussion: I feel like I caught a glimpse of a new universe. I really feel that from these days forward, I am going to change. I can feel it happening. I think this is what I want—to change at a faster rate, and to direct that change towards positive ends. If I can increase my momentum, I seek two positive results: 1) I will be able to consummate more good ideas, 2) I will, in effect, create warps by bypassing lesser pursuits in favor of greater, more sublime, more worthy pursuits. I want to explore the world of my own potential. It is a world that I know so little of. I think I should keep exploring and try time after time to answer to the call of my potentials yearning to get out. List what I want to do, then prioritize it. Judith said my behavior with letting Nawang the Sherpa manipulate me was “unbalanced.” She said I’ve got to try to be balanced like a ball! Interesting again! Making my balance like that of a ball – It occurred to me that a ball changes its momentum instantly as it bounces against objects. In line with this analogy, I must not only build personal momentum, but I must also be able to change the direction of that momentum quickly as circumstances require me to do so, in order to most efficiently utilize my energies. My (or, generally, people’s) interactions with reality can be controlled and propelled towards a chosen destination through harnessing innate, but as yet, undeveloped or under-developed personal power. Discussion: I was thinking today that one could understand things just by observing them and applying thought to them. Profound questions could have their answers ascertained by studying the subject. Instead of expending such energies on creating momentum, find out where your innate momentums, or drives, are. Harness the innate energy. AXIOM 1: DISCOVER INNATE MOMENTUMS. But “magic,” this idea, is style, of course! What I mean is to use magic as a way to view the world. A magical way to perceive the forest is as a living, conscious entity. The magical way to view a person is as a witch, an angel, a God, a thief, a devil, a great person, etc. I would like to write about efficiency curves or success curves or proficiency curves. There could be many graphs, depending on the person’s own characteristics and the task relative to these abilities. It’s something to think about!! 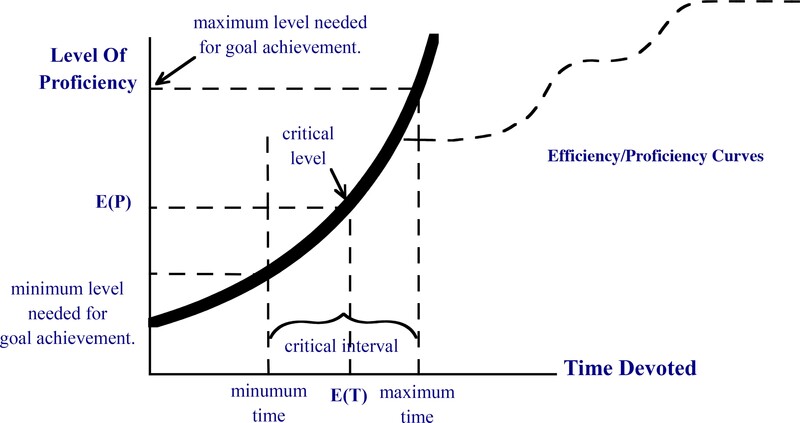 I should seek out activities for which the graph would be exponential, with as steep a slope as possible at the critical level, or the steepest average slope in the critical interval. The idea about discovering innate momentums is interesting. It makes me suspect that what was happening in Joe Karbo’s idea to write down everything you wanted as goals was that by creating goals which you really, really wanted, you had a natural, existing super-drive to get them. So, in essence, he was discovering innate momentums. He was using Axiom 1. The talk of proficiency curves seems a novel and interesting idea. I suppose that I could even use the idea by plotting actual progress in the past or plotting present increases in a test experiment. I was considering last night: GO TO THE SOURCES. What do I mean by that? Two things. The inspiration for the thought was this: I have heard a theory that, for example, composers drew on a universal source – that is, for example, that when a composer created a piece of music, he was actually tuning in on a ethereal source of great music – a source which exists but which can’t be detected by our senses. So, I was conjecturing: if I can tune in on the sources of the things I want, I, too, can create (great things), though now that I write it down, it seems rather far-fetched. Could environment of the composers be something to duplicate? The other thought that came to me from “GO TO THE SOURCES” was practical. In this case, I simply meant to go directly to the well-spring of what you want to do. If you want to make a hit record, seek out the environment where these are being made. If you want to be a great lover, seek out the scene where the women are available and hungry – the places other lovers operate. If you want to be a mountaineer, hang out in the Alps, Andes, Himalayas, etc. In example above, I can try to formulate a new direction, but my present success leaves me feeling bogged down. When I say bogged down, I can be having fun, but the fact remains that I am (or feel I am) restricted from movement. Excuse me, but I do not think that a 2-dimensional graph suffices to depict the proposed situation. The reason is that C2 is not necessarily more desirable than C1: only the uppermost states are “superior” to the others. The translation of this in practical terms: if you succeed at something, great, but if you are subsequently lost as to what to do next, you are not necessarily better off than the ‘other you’ that went along a longer, more steady path. A 3-D diagram would depict this. I’m having trouble artistically. 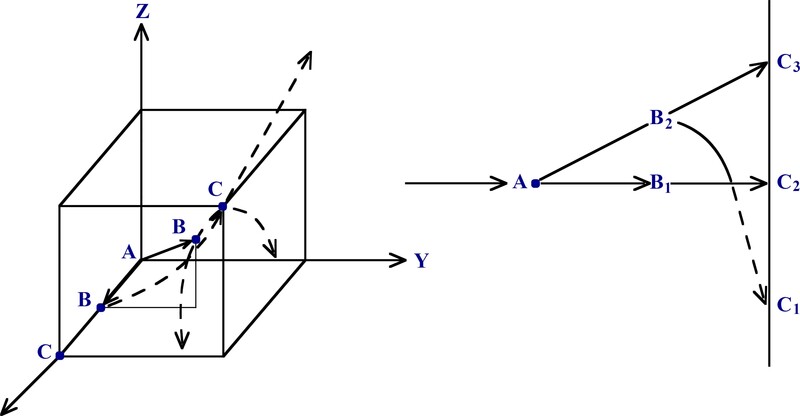 What I am trying to depict is that the Z-axis represents “highness,” which is what I seek. You go from A to the higher state of B2, but once in B2, you have a natural momentum of going to C1 unless you shoot for C3, and C1 is below C2 which is where your momentum would have gone if you had stayed on the steady course, A B, C2. Well! This is too complicated; I’m not sure of what I’m writing! I’m sure though about the reality of having a success tie up my energies when I don’t have a follow-up goal with momentum already building towards it. In the case cited, maybe I should have thought: if I take Judith, what next? What’s my next move? What is my momentum building towards? I feel strongly that there is a positiveness in creating goals so that at any given point in time, there is an urgent necessity to strive towards something, which keeps you high, even if the attainment is just sitting in the sun writing!! In the case given, I wonder if quickly changing my momentum towards Adik (a fetching younger woman) would not have proved more fulfilling. iii) aligning goals with energies may be a moderate style and may, in effect, yield optimal enjoyment. This still leaves me to consider the present paradox mentioned. Do I need presently a firm direction? I like the feeling of a firm direction, but I shun pressure that may suppress my enjoyment. PROBLEMS ARE LEVERAGE, CREATED BY THE NUCLEUS OF THE SOUL’S DESIRES. I feel pressured to renew my trekking permit (although this can be circumvented with an excuse letter), buy the coral mala on 7th December in Kathmandu and change money. If it wasn’t for these considerations, I would feel content to remain in Junbesi. Was I guilty of lack of proper planning? But I wanted to let things develop naturally with Judith. The crux of this question is: is there some direction that, if I could think of it, would erase these lesser problems in light of its brilliance? Th s is the eternal question!! Presently, I can’t think of the answer! I can make up short-term lists of what I want to do (as well as the long-term lists). Perhaps, I can also make Push Lists: a list of things to do that I wouldn’t normally do because of some “practical” consideration, but things I would like to do or love to do. This would create a separation between wild and wonderful things and ordinary objectives. I called it a Push List because it would be full of ambitions that would push me to new limits and beyond my ordinary momentum. Goals can be analyzed for: side effects, spin-off, integrity, is there something better to go for? What will I follow success up with? “Ultimate goals” are the pinnacle of my dreams: the highest attainment that I want (and could hope to reach). Long-term goals are the things that I am presently seeking over the long run. Medium-term goals are aimed at the long-term goals. 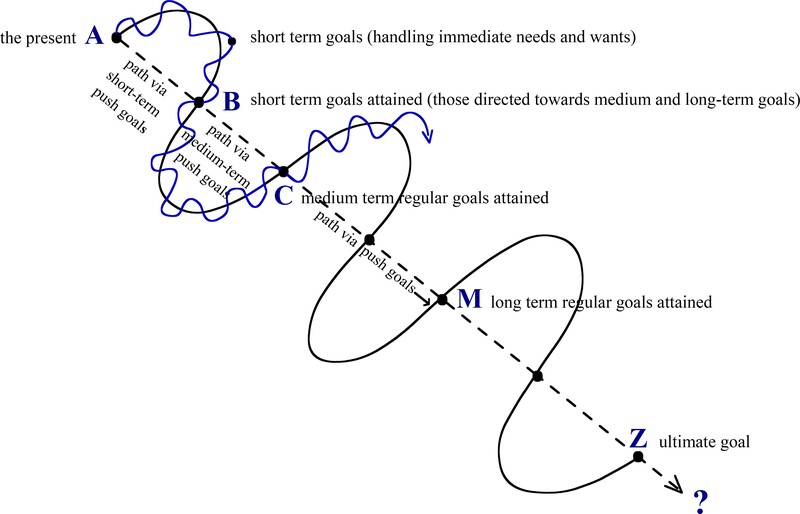 Short-term goals handle present needs and wants and also some would be devoted towards medium and long-term goals. “Push lists” would be things that would carry me beyond my ordinary expectations. Push lists could serve as a warp (or THE warp) between my lesser goals (short, medium and long-term) and my ultimate goals. 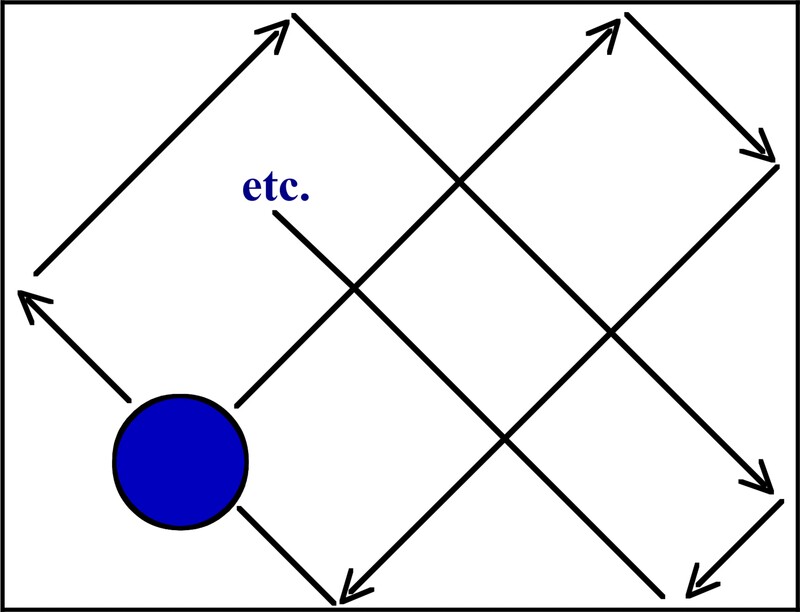 Warps: If I have a set of goals and sub-goals, is there an activity that I can engage which, if accomplished, would bypass much of the work? (For example, I wanted to a. climb Mt. Polkalde to go higher and, b. to go over 20,000 ft. Climbing Island Peak took care of both of these at once. I bypassed climbing Polkalde and it’s fair, considering the reason I wanted to climb it.) Eventually, I believe I’ll put this format into practice. Discussion: Motivators. Yesterday, it occurred to me that thoughts are the essential motivators. Have you ever noticed the lift you feel, or inspiration, when someone says special words to you? These thoughts, expressed verbally or in writing, communicated to you can and do change you life. Words and thoughts truly seem like one of the basic motivators, but, at least for me, they have to, in order to serve as motivators, have meaning in order to touch and inspire me. I think I have no better idea at present than to use thoughts as motivators. The question is: how do I inspire myself, i.e., how do I continually enable myself to create thoughts which have meaning and are inspiring? The answer presently seems to be to continually reason them out. Sit down, write it out if need be, discover the reason for a drop in motivation (if that happens) and discover rational reasons why I should think specific thoughts that will be motivating, then think them.